Dana at Fun in 1st Grade has been kind enough to share her forum with others and I am so excited to be featured on New Teacher Blog Tuesday! To celebrate, I'm sharing a bit of something I've been working on. 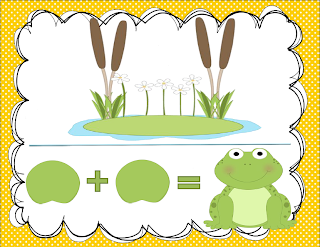 Here's a froggy math mat to use when composing/decomposing numbers or telling math stories for addition. Download the preview file to get the Free Froggy Math Mat! I am so glad to have found your blog! I am a new follower! Great freebie! I'm so glad to have you as one of my featured bloggers! You're welcome! And I just entered your giveaway!! I'm back to give you another award. I absolutely love your blog design. It's so adorable! Stop by my blog to receive the Liebster Award! Thanks for the Froggy Math mat!! It is so cute :) Just found your blog! Thank you! Glad you can use it!